Wo sind Sie jetzt? | Where are you now? Train stations on Christmas Eve are emptier than usual and an unlikely place to visit. But I’ve always viewed the timing as a unique photographic opportunity. I was in Berlin on Christmas Eve 2010, and with the city already covered in snow, I set out into the evening under additional heavy snowfall. 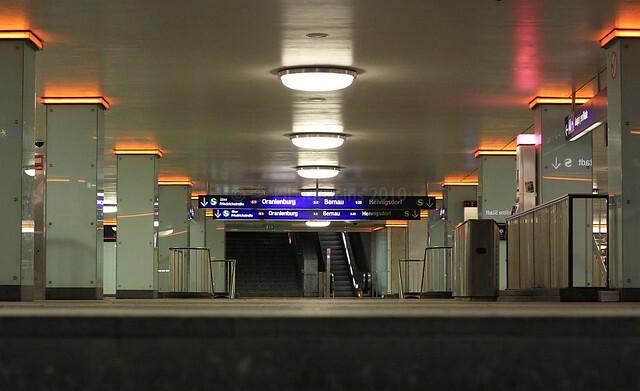 I wanted to photograph the quiet conditions in the capital city, and I stopped at Potsdamer Platz station, normally a busy transfer station in the Mitte (or central) district. My spontaneous visit and photographs resulted in something more profound. 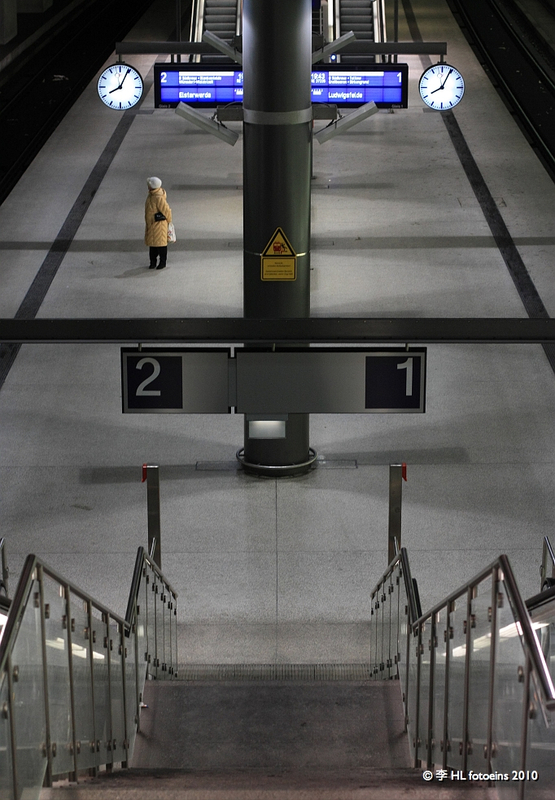 In S-Bahn (suburban services) Potsdamer Platz, there on platform 2 was a woman; she was the only person along the entire length of the platform. I guess she was waiting for a train to take her home, or to visit friends for Christmas dinner, a party, or gathering. I hope she arrived safely that night. The Christmas and New Year’s holiday season can be a rough and tumultuous time, even for people in the best of situations. It’s easy to consider how some might feel lonely and depressed, and it might even lead one to associate the number of suicides peaking around that time of year. However, some studies have shown that springtime is generally the peak period for depression, with extreme cases leading to suicides. As (northern) spring is in full swing with this posting, please take a moment for the people about whom you care, and let them know you’re thinking about them. Additional photos from Christmas Eve evening in Berlin are found here. I made the photos above on Christmas Eve 2010 at Bahnhof Potsdamer Platz in Berlin, Germany. This post appears on Fotoeins Fotopress at fotoeins.com as http://wp.me/p1BIdT-3fV. THIS is just a WONDERFUL shot Henry. You’ve captured something special here. I’d love to see the same shot when the place is crowded too. Feet above and heads below. That may be a bit harder tho with all the people rushing around. Congrats! Thanks, Jim! I was lucky I happened to be there right at that time, even though everyone is supposed to have their camera with them at all times. 😉 Funny thing about older photographs is that it’s easy to forget about them, albeit temporarily, even though I had a “gut feeling” the second photograph would be important. Despite this and having spent two months in Berlin last fall, I passed through Potsdamer Platz a number of times. Yet, I forgot to take a complementary shot (same angle, same configuration) as you suggested. I forgot about the Christmas Eve 2010 shots and had I remembered, I would’ve likely drawn the same conclusion to make a photo when the station is typically busy. Well, you know how I felt about this photo when you first took it and shared it — I feel the same way about it now. Thank you for posting it again. Thanks, M; that photo still delivers the same impact, doesn’t it? Thanks again for reading and for your comment!